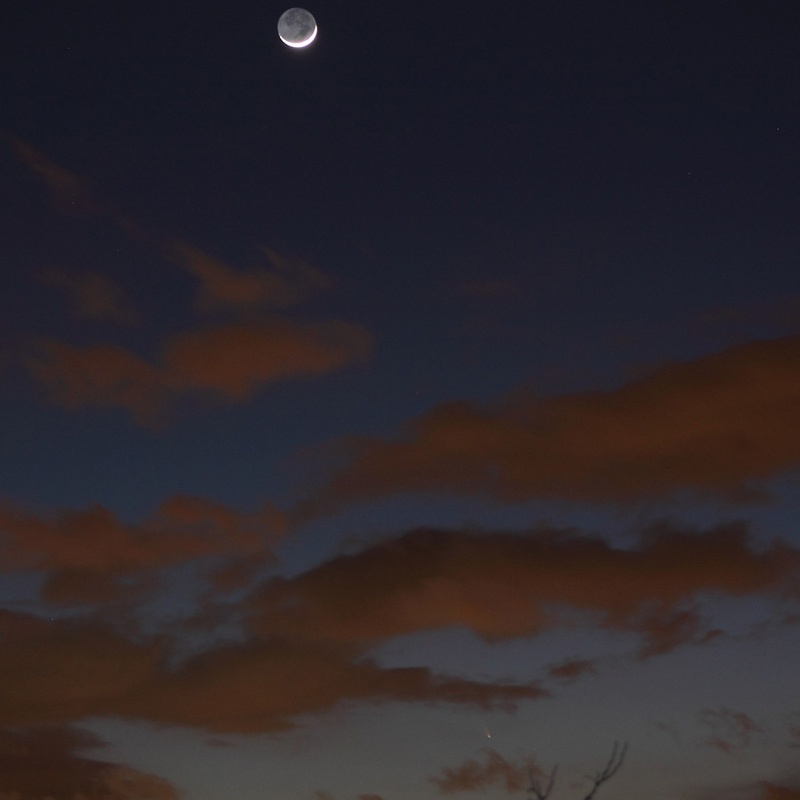 Moon & PANSTARRS by Christopher Christie, March 13, 2013, from Rocky River, Ohio. Canon EOS Rebel T3: ISO 400, f/4.5, 2.5 sec. Mid-March saw a good bit of interest in Comet C/2011 L4 (PANSTARRS). As it approached perihelion the comet put on a good show for observers in the Southern Hemisphere. It was known PANSTARRS would, after its close passage to the Sun, become an object for Northerners to admire, perhaps naked-eye, and excitement grew. 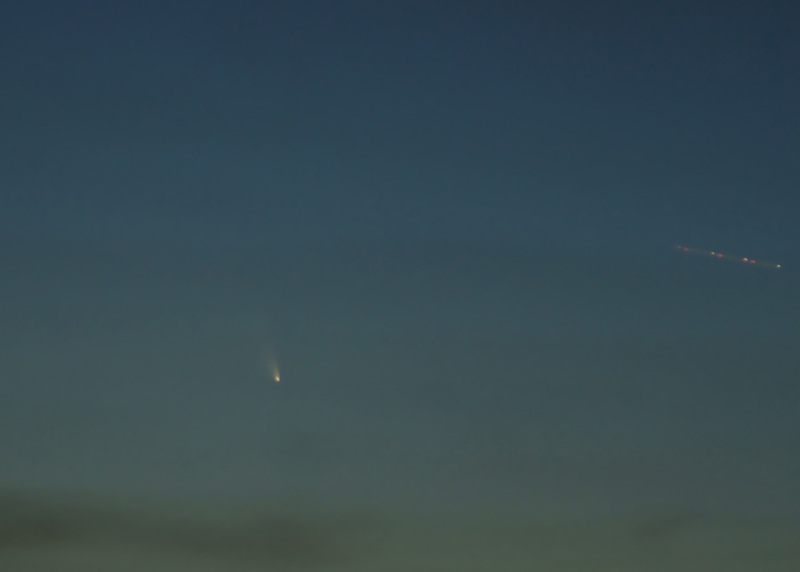 Two Trails: Comet PANSTARRS and Airplane, by Matt Franduto. Sony A500: ISO 400, f/4.5, 4 seconds. March 14, 2013. Brunswick, Ohio. After its March 10 perihelion, die-hard comet-spotters looked to the west every evening, hoping for an opening in the clouds. Most tries were met with disappointment. Sometimes an opening would appear and the comet would glow forth in the dimming twilight. Then, after the sunset of March 14, it seemed the weather would cooperate. Mostly-clear skies greeted observers and crowds gathered in several places affording views of a distant horizon. One such place was Mapleside Farms, an orchard and restaurant in Brunswick, Ohio. The view from their parking lot is splendid, with the terrain dropping away rapidly to lowland orchards and a miles-wide valley. Astronomer-folk, including a group of CAA members, and the curious stood transfixed watching the western horizon, waiting for the sunset to fade, hoping distant clouds would remain far off. 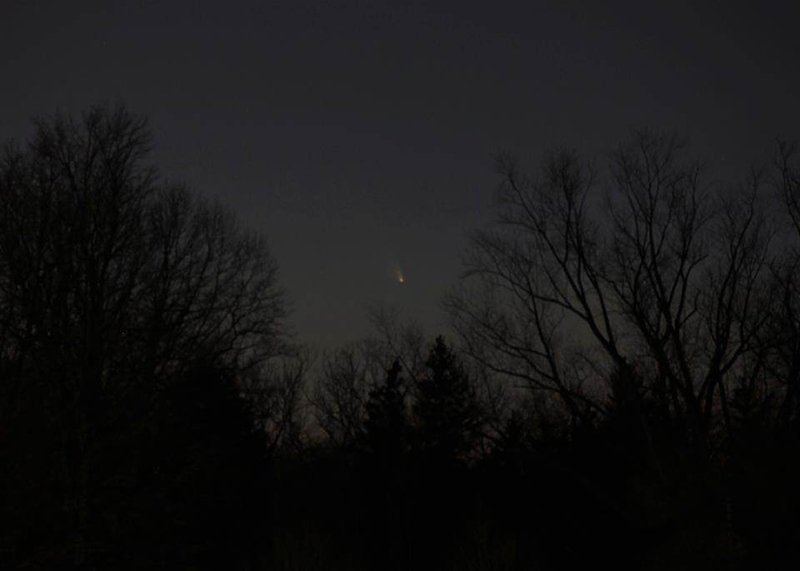 PANSTARRS over Avon, Ohio, by David Nuti. Nikon D5000: ISO 1600, f/5.6, 4 sec., March 14, 2013. PANSTARRS over Avon by Jay Reynolds. Canon EOS Digital Rebel XTi: ISO 800, f/2.8, 1 sec., March 14, 2013.
in some of the photos by other CAA members. In Dark Skies, Comet PANSTARRS over Avon, by Bruce Lane. Canon EOS Digital Rebel XT: ISO 800, f/6.3, 1.6 sec., March 14, 2013. 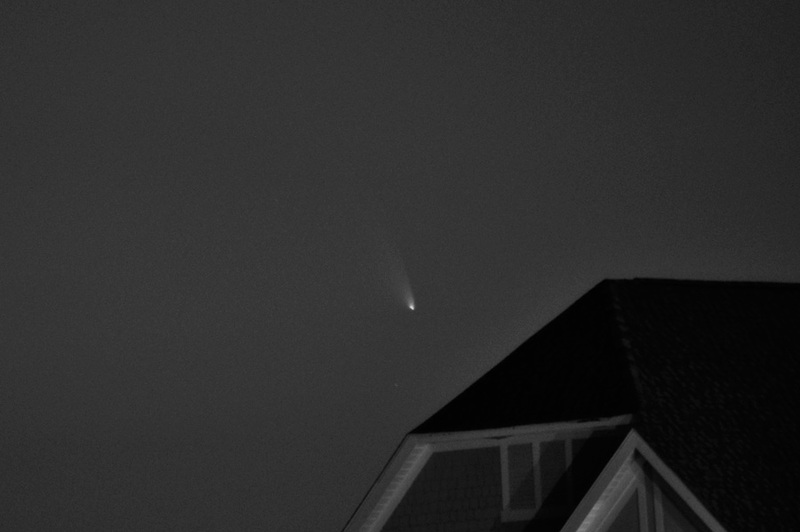 Comet PANSTARRS over Huntington Park, Bay Village, by Joe Hamlin, March 15, 2013. 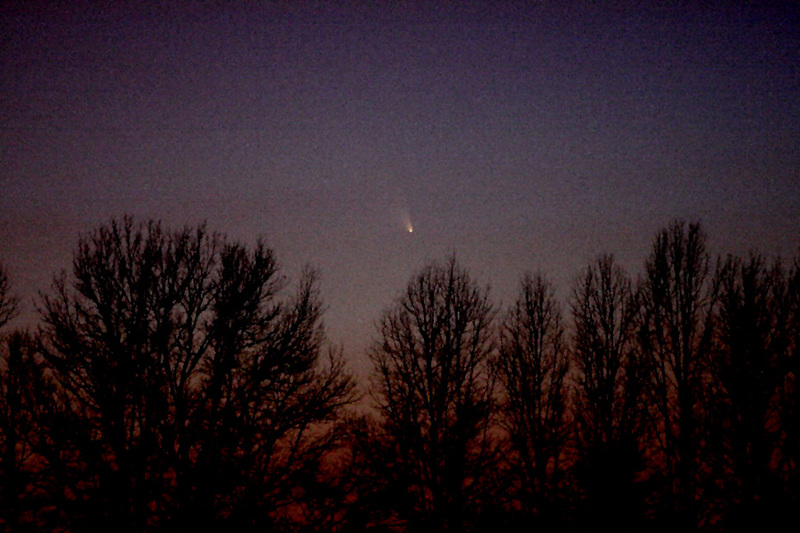 Comet PANSTARRS images shown here were created and shared by CAA members. In many cases we have modified their original efforts a bit to present via this Web site. As a matter of style, we have settled on an all-caps, non-hyphenated form for the name. PANSTARRS is a non-periodic comet discovered in June 2011 using the Pan-STARRS telescope located near the summit of Haleakala, on the island of Maui in Hawaii. 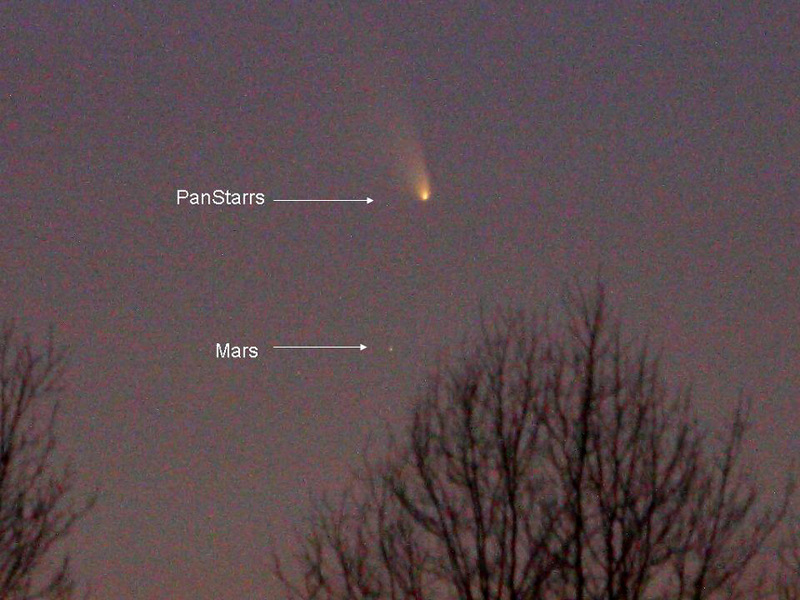 Pan-STARRS stands for: Panoramic Survey Telescope and Rapid Response System. 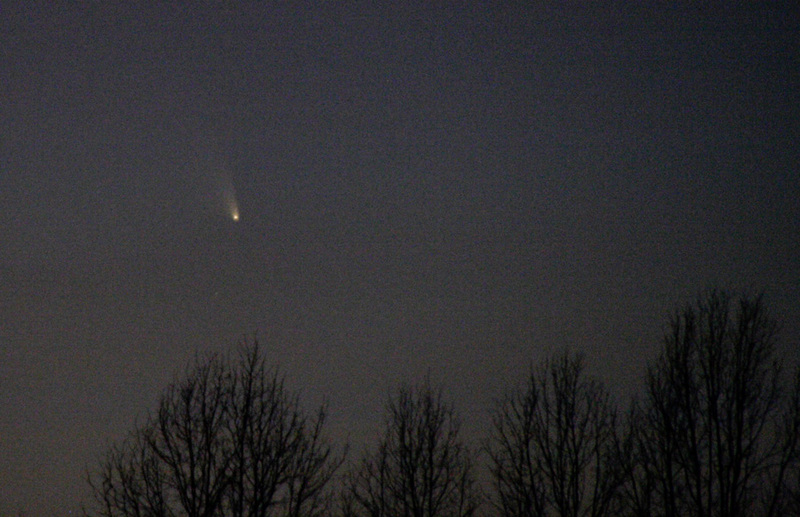 Because Pan-STARRS is used in cometary discovery, other comets also bear the program moniker. Wikipedia on Pan-STARRS. This entry was posted in Uncategorized and tagged astronomy, astrophoto, C/2011 L4, CAA, comet, Comet PANSTARRS, Moon, northeastern ohio, photograph. Bookmark the permalink.